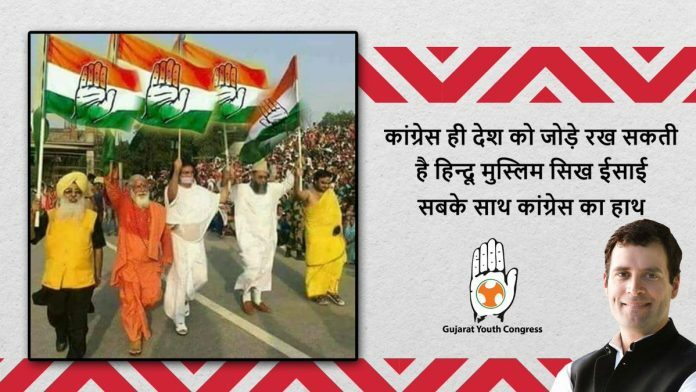 New Delhi: To consolidate the secular image of the Congress, the party’s youth wing in Gujarat has shared a photoshopped image on Facebook and Twitter. The post on Twitter has 68 likes and 29 retweets, and 64 likes on Facebook. The image was posted on Twitter on 9 April, while on Facebook it was uploaded on 10 April. The original picture was clicked at a Republic Day parade event at Wagah Border in Amritsar in 2018 where inter-faith leaders — Acharya Lokesh Muni, Swami Dipankar, Sushil Goswami, Dr Imam Ilyasi and Paramjit Singh Chandhok — had carried the Indian flag, which was replaced with the Congress flag in the photoshopped image. This is, however, not the first time that a political party has used this picture to promote itself as a secular organisation. Last year, the picture was photoshopped and used by former Samajwadi Party (SP) legislator Meera Deepak Yadav. The accompanying text read: “Sab samaj ki hai pukaar, Meera Deepak Yadav ab ki baar. (Everyone is calling for another term for Meera Deepak Yadav)”. The photshopped image was exposed by Swami Dipankar. Acharya Lokesh Muni had also shared a video of the Republic Day event, and urged the police and the administration to take immediate action.